I start off this review with that quote because Chiun would understand the underlying philosophy that created the worldwide organization known as THE ASSASSINATION BUREAU (LTD.) being in the same business himself. As the Chairman of the organization, Ivan Dragomiloff (Oliver Reed) puts it; The Assassination Bureau fulfills a necessary evil. The Bureau assassinates those who are evil and who need assassination. They do not kill indiscriminately. They are not murderers. The Bureau assassinates those who only cause pain, misery and suffering. The Assassination Bureau (Ltd.) demands proof that the people who are contracted to be assassinated truly deserve assassination. At least that was the dream of Ivan’s father. However, due through the corrupting influence of the Bureau’s Vice Chairman Lord Bostwick (Telly Savalas) on the other members of the Bureau, the purpose of The Assassination Bureau (Ltd.) is no longer what it once was. That is why Ivan accepts the commission of aspiring journalist and women’s right advocate Sonia Winter (Diana Rigg) to have him assassinated by his own organization. Ivan sees this as the ultimate test of his organization. If they kill him, so be it. He is the supreme assassin and if they kill him they he does not deserve to lead. But this gives him the opportunity to remove the dead wood from his organization and test their loyalty. It’s kill or be kill, assassin against assassin. And in the middle is Sonia Winter who has no idea that she is feeding vital information to Lord Bostwick, who owns the newspaper she wants to write for as she is unaware of Lord Bostwick’s affiliation with the very organization she wishes to expose. During the 1970’s there had to be somebody in charge of programming at ABC here in New York who loved THE ASSASSINATION BUREAU (LTD.) I have no idea who they were, if they were male or female but I thank God for them. Because they scheduled THE ASSASSINATION BUREAU (LTD.) on a regular basis on The ABC Sunday Night Movie which is where I first saw and fell in love with this movie. And every time it aired, I watched it. In fact, I turned my mother and father onto it as they simply had to see this movie because if I knew it was coming on Sunday night, I refused to leave the house for any reason at all. In short, THE ASSASSINATION BUREAU (LTD). is a movie that I fell in love with the first time I saw it and one that I have recommended to everybody who will listen to me. It’s one of the best examples of a pure adventure movie that I’ve ever seen. It’s thrilling, it’s exciting, it’s heart-pounding and it’s funny. In fact, it’s wasn’t until I saw “Raiders of The Lost Ark” that I fell in love with a movie as much and yes, THE ASSASSINATION BUREAU (LTD.) is that good. As Ivan Dragamiloff Oliver Reed creates a hero who is as charismatic, knowledgeable and brilliantly resourceful as Doc Savage, James Bond or Sherlock Holmes. This movie should be seen simply for seeing Oliver Reed in a heroic role. I love his performance for the same reason I love Richard Boone as Paladin in “Have Gun Will Travel.” These are actors who look more like the bad guys but are able to translate that into good guy roles of interesting dimensions. 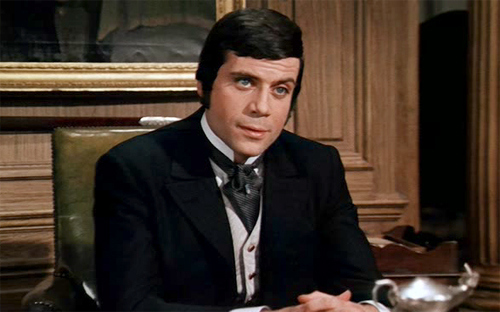 Oliver Reed’s Ivan Dragamiloff is so much fun to watch because I got the impression watching him in action in this movie because he seems to have so much fun playing a good bad guy. 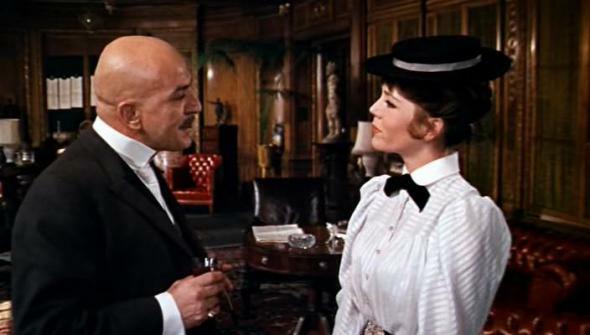 And this movie also has to be seen for Diana Rigg and Telly Savalas. 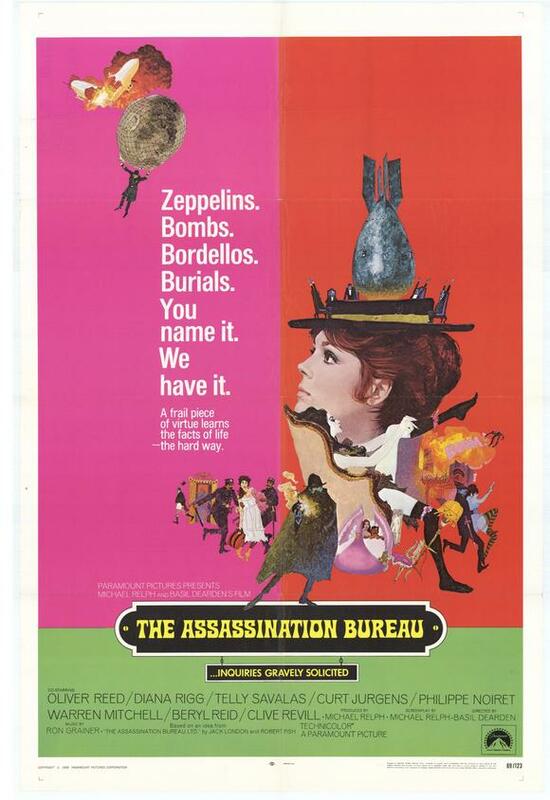 THE ASSASSINATION BUREAU (LTD.) had to be made around the same time as “On Her Majesty’s Secret Service” which they also starred in and their chemistry is apparent in this movie as well. It’s nothing short of a delight to see them on screen together. In fact, everybody’s chemistry works well together. Oliver Reed and Diana Rigg also have a great time in their scenes together and it’s so much fun to watch them work. Okay, I’m not going to go on and on and on about it. THE ASSASSINATION BUREAU (LTD.) is one of my favorite movies and if you’ve been reading my reviews all this time then you either trust me or not. The bottom line is this: if you trust my judgment at all when it comes to movies then watch THE ASSASSINATION BUREAU (LTD.) It’s one on the best movies I can recommend to anybody in terms of story, casing, acting and just sheer fun. It’s one of My Ten Favorite Movies Of All Time and I suspect that after you watch it, it’ll be one of yours.